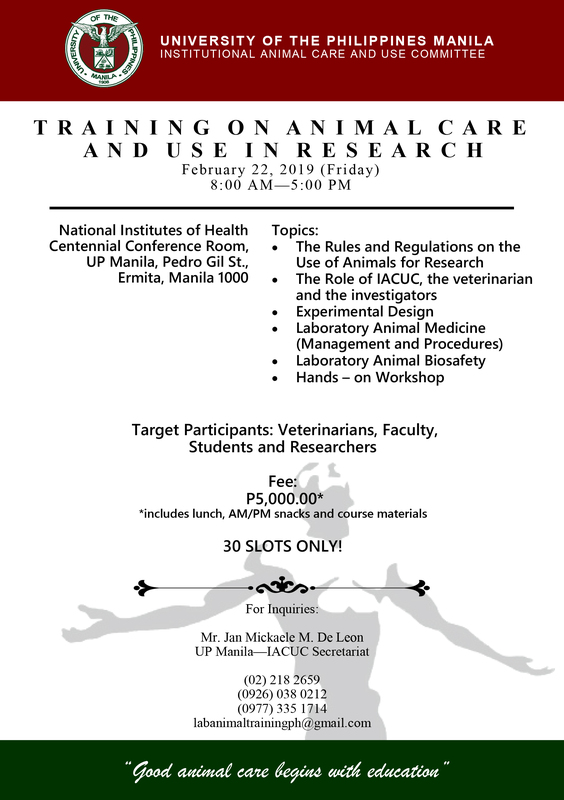 IACUC-UPM: "Training Workshop on Animal Care and Use in Research and Animal Biosafety"
The Institutional Animal Care and Use Committee of the University of the Philippines Manila will be conducting a Training Workshop on Animal Care and Use in Research and Animal Biosafety on February 22, 2019. The lectures will be conducted at National Institutes of Health Centennial Conference Room. The training generally aims to promote and advocate animal welfare in research, targeting 30 participants from academic and research institutions in the Philippines. The pre-registration fee is Php 5,000.00. To complete your registration, go to this website and register: https://goo.gl/forms/RA9vAJy1tWObDzw63. This is limited to 30 slots only. UP Manila Development Foundation INC. Please click here to register: https://goo.gl/forms/RA9vAJy1tWObDzw63. For any inquiries, please do not hesitate to contact Mr. Jan Mickaele De Leon at (02) 218-2659 or email us at labanimaltrainingph@gmail.com.